Have players bend their knees and put the ball on the floor between your feet. The players will put their right hand on the ball from the front of their body. The players will then put their left hand on the ball from behind their body. The players will pick the ball up to about knee height. Next the players will drop the ball and quickly switch their hands so that they catch the ball in the air with their right hand behind their right leg and their left hand in front of their left leg. If this is too difficult, let the ball bounce 1 time before the catch. Work on having quick hands while staying in a stance. All players should have a ball and have a seat on the sideline. Players should put the ball just outside their right hip and begin dribbling. 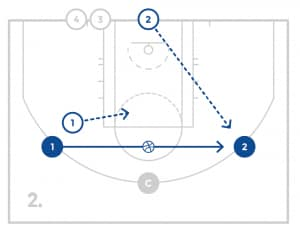 After 15 seconds, the players will straighten their arm out to their right side so that the ball is stretched far away and again dribble for 15 seconds. 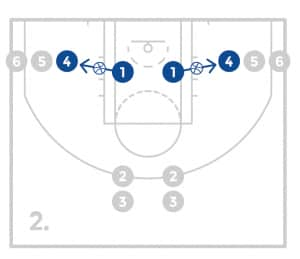 After 15 seconds have the players dribble with a straight arm close to their legs and move the ball out to their right and then dribble it in towards their body and continue in a circle motion for another 15 seconds. This completes 1 set which will be done again before changing to the left hand. Have the players get a ball (or share) and find space on the court. 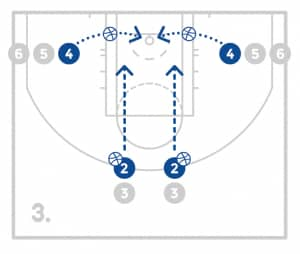 The players will take 1 or 2 dribbles and then lift the opposite leg from the hand the ball is in. When the player lifts their leg, they will dribble under the leg and gain control with the other hand. The player will then repeat the process with the other hand back and forth for the allotted amount of time. 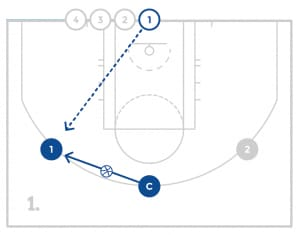 A kick pass is a pass from a teammate driving to the basket, out to a player on the perimeter. The kick pass usually happens while moving and is often passed from the side of the body predominantly with the hand that is on the same side as their teammate. When making the kick pass, the player’s arm will extend and the thumb will snap down towards the ground. Have the players partner up with one ball and both face the same direction so that one player can see their partner by turning their head to the left and the other partner can see their partner by turning their head to the right. Both players should be in a good stance and will pass the ball back and forth by pushing the ball with the arm that is closest to their partner and snapping their thumb down. The players will continue passing back and forth for the allotted amount of time before switching sides. 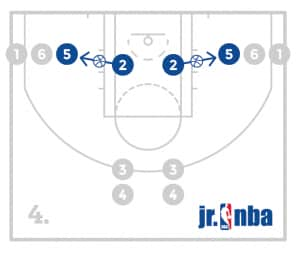 Have the players start in 2 lines, 1 at the top with the ball, and 1 on the wing. The players at the top will have a ball and will drive the ball towards the basket on the same side as their teammate. As the coach or imaginary defenders comes to help, the player will make a quick kick pass out to their teammate who will catch and shoot. 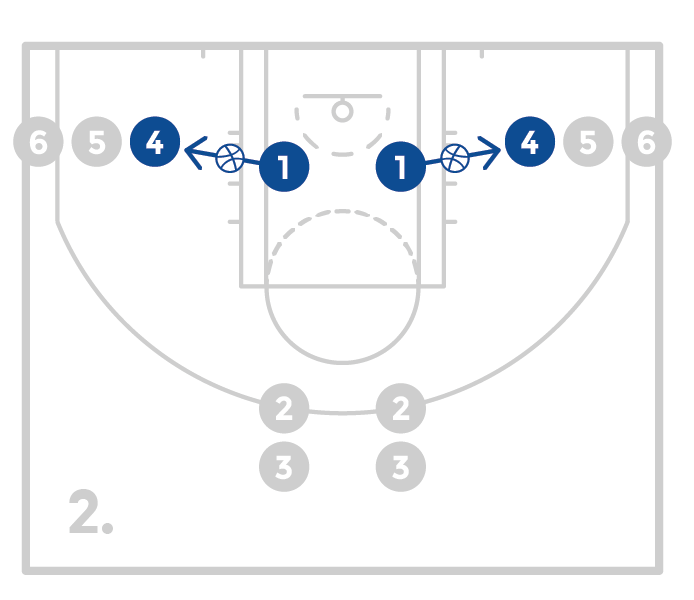 The shooter will get the rebound and both players will go to the back of the opposite line. Continue this process for the allotted amount of time. The up and under is one of the most fundamental post moves in basketball. The player will catch the ball in the post with their back to the basket. The player will then turn in either direction as if they are going to shoot the ball. As they turn, they will shot fake, hoping to have the defender jump or raise up. The offensive player will then step with their back foot toward the basket and jump off 2 feet for a lay-up. Have the players partner up and face each other with one ball. One player will pass the ball to their partner. 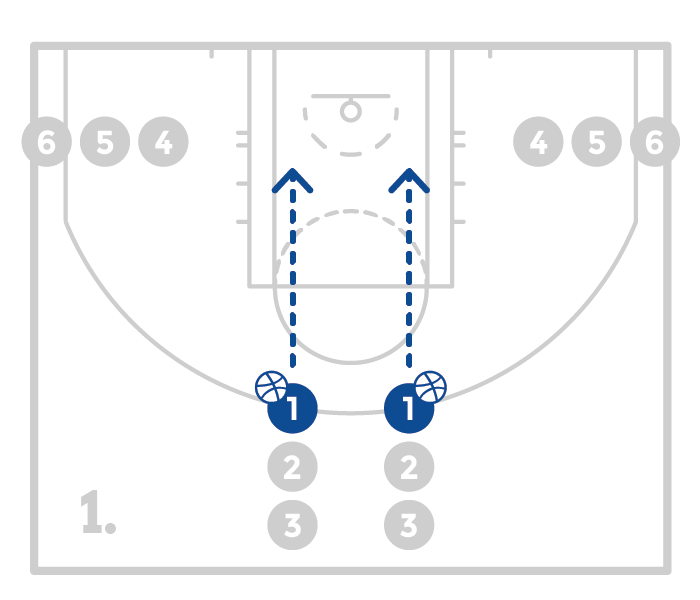 When the partner catches the ball, they will execute an up and under move until the end and instead of shooting will hold onto the ball turn back and pass to the other partner who will repeat. The partners will continue going back and forth working on their up and under footwork. Make sure the players are not picking up or dragging their pivot foot which would lead to a travel. Work on sitting low as the player shot fakes lifting the ball up but loading on their outside leg to step through. One player will start on each block and there will a line on the wing in front of each of them. The first few players in each line will have a ball. 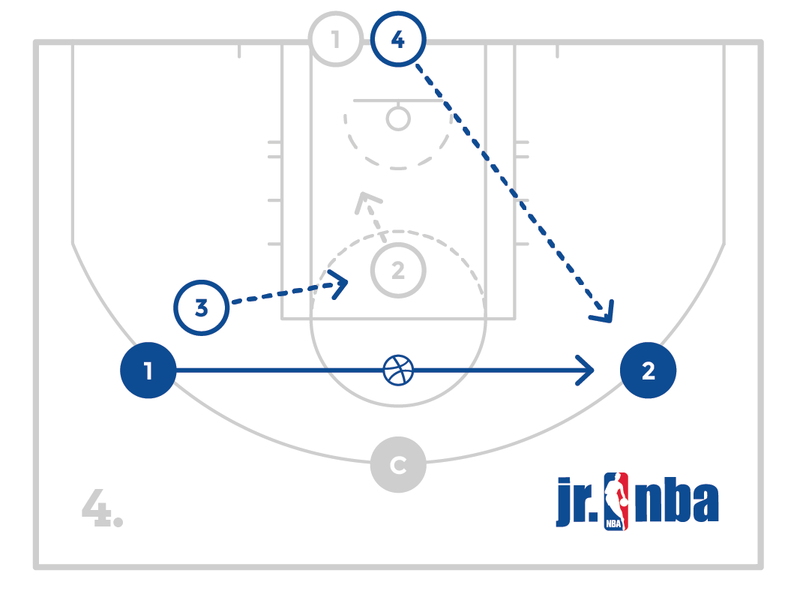 The first player with the ball will make a good post entry pass to the player making a good post up on the block. The player will catch the ball and execute an up and under, get their rebound and go to the back of the line. 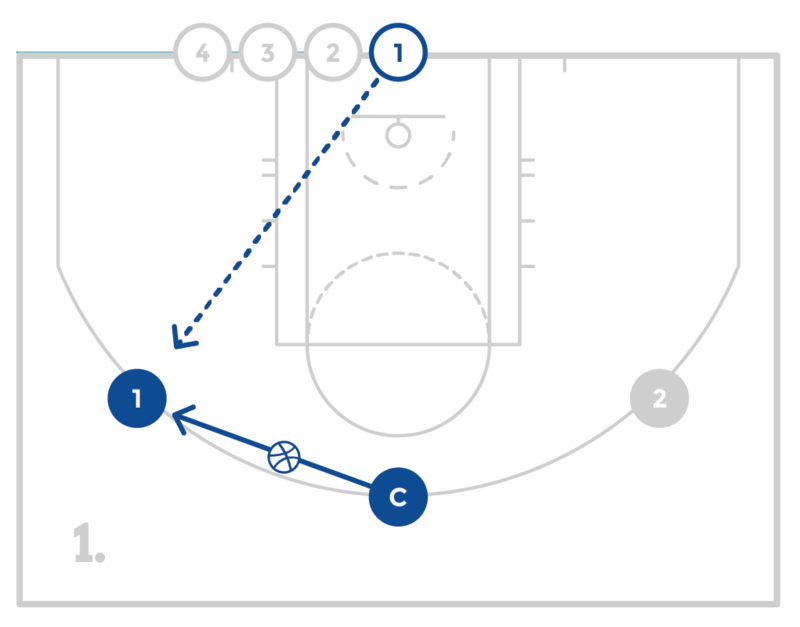 The player who made the pass will then run to the block and post up and prepare to receive the pass from the next person in line. This process will continue for the allotted amount of time and then the players will switch sides. 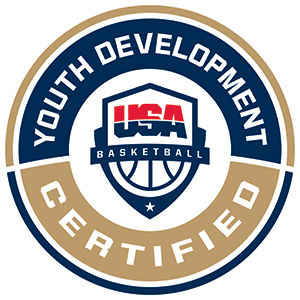 Make sure the players are executing good post entry passes, the players are posting up and making good up and under moves. The free throw is a very important part of the game that can play a big part in winning and losing. Free throws are also know as foul shots and are taken from the free throw line (or foul line) with no defense. Each free throw is worth 1 point. Players are awarded the opportunity to shoot free throws if they are fouled while shooting, if the other team has committed more fouls than permitted, or if there is a technical foul. One of the most important aspects of the free throw is to relax and do the same routine every time. It is typical for players to take a few dribbles, relax and take their shot without jumping. Every player should develop a routine that works best for them to maximize the opportunity for “free” points. When a shot is missed, the player that retrieves the ball is credited with a rebound. Rebounding requires players to be physical, have quick reactions and pursue the ball. Drive and kick is when a player dribbles the ball toward the basket and the defense reacts to the drive by helping their teammate. As the defense helps, the offensive player will kick or kick out (pass) the ball to their teammate. Help defense means helping a teammate who is guarding the ball. The ball is the most important part of the game so even if you are not guarding the person with the ball, you must be ready to help them if needed. 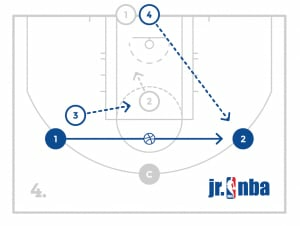 Have a coach with the ball on the wing and another coach or player on the other wing and then 2 lines on the baseline. 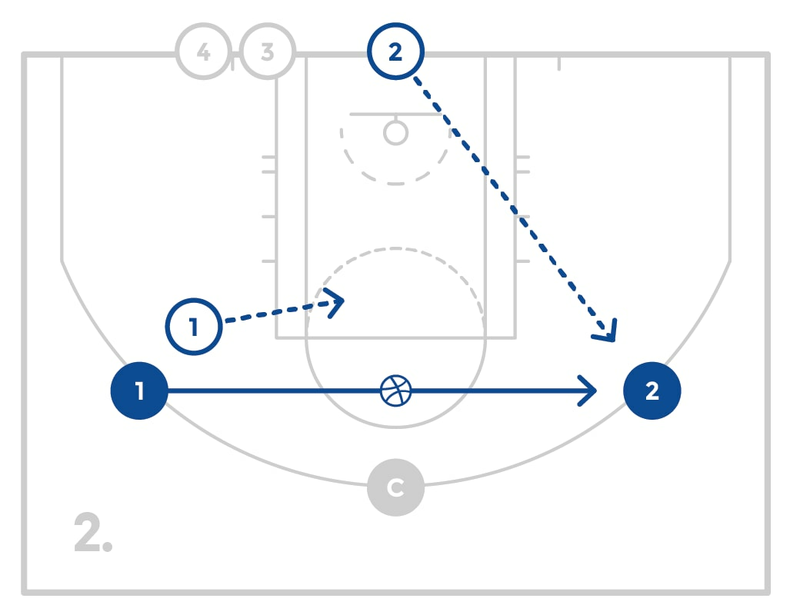 When the ball is passed back, that player will now jump into the help position saying “help, help, help!” while a new player from the other line closes out to the ball and the original defensive player steps off the court. Make sure the players are seeing both their player and the ball when they are in the help position. Make sure both players are talking and the drill stays high energy. Divide the players into 3 teams of 4 (if you have an odd number, add substitutes to teams). There will be one team at ½ court to start the game on offense, there will be other teams on both ends that will start on defense. The team on offense will try to score on a basket. 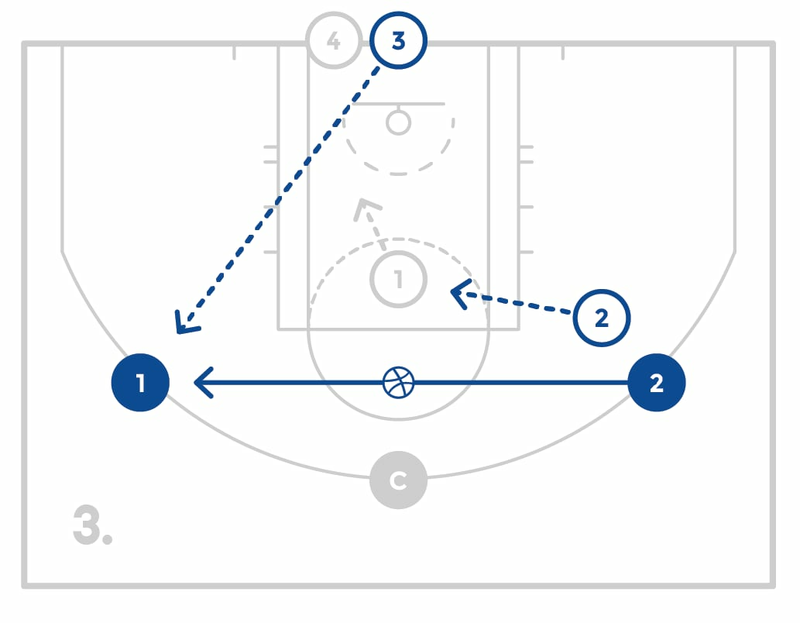 If they score they will quickly get the ball and go to the other basket on offense. Whenever the defensive team stops the offensive team, they become the offense and go to the other basket. Continue this action until a team has won. This game should be quick and high energy. It allows the players to move up and down the court without getting out of control as the defense will always be set. Make sure the defense is matching up as the team comes towards them.